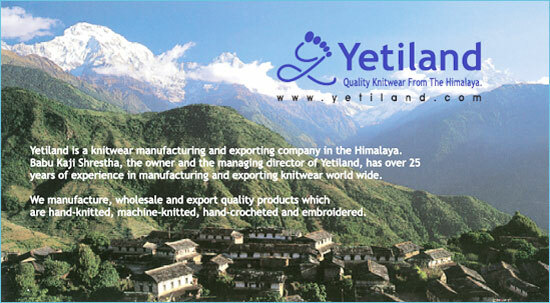 Yeti Land Babu Kaji's Knitwear is a knitwear manufacturing and exporting company in Himalayan. The company manufactures wholesale and export quality products which are hand-knitted, machine knitted, hand crocheted and embroidered. To sustain the interests of all stake holders of the company: buyers, suppliers and employees. Yeti Land Babu Kaji's Knitwear was established over 25 years ago. Babu Kaji Shrestha is the owner and managing director of the company. The company is into handicraft business. Woolen bags used to carry things by women. 100% woolen sweater for both men and women. Woolen and Cotton socks and shoes made up of wool. Woolen head wears for keeping head warm during winter. Wrapped around neck to keep oneself warm. Woolen gloves are worn in hands to keep hands warm during winter. Woolen leg warmers to keep our legs warm during winter.